Two members of Circus Irritant rig a metal sculpture of a spider made by the Mutoid Waste Company in the roof of the Hacienda night club in Manchester for the launch night of the Velvet Revolution Tour whose purpose was to promote awareness around the country of the civil liberties implications of the legislation contained in the1994 Criminal Justice and Public Order Act that criminalised raves free parties free festivals squatters and those living a mobile lifestyle. Three hippie trucks parked up outside a block of squatted flats in Hulme in Manchester with Smash the Criminal Justice Bill graffiti written on one of the upper floors before the launch night of the Velvet Revolution Tour at The Hacienda. Unknown to the young people attending, a group of pretend riot police in full riot uniform with batons drawn invade a gig at Middlesex University Student Union pretending to bust the venue during the Velvet Revolution Tour. A skeleton sculpture holding a machine gun hangs in the light in front of a band playing in Sheffield Students Union as part of the Velvet Revolution Tour. 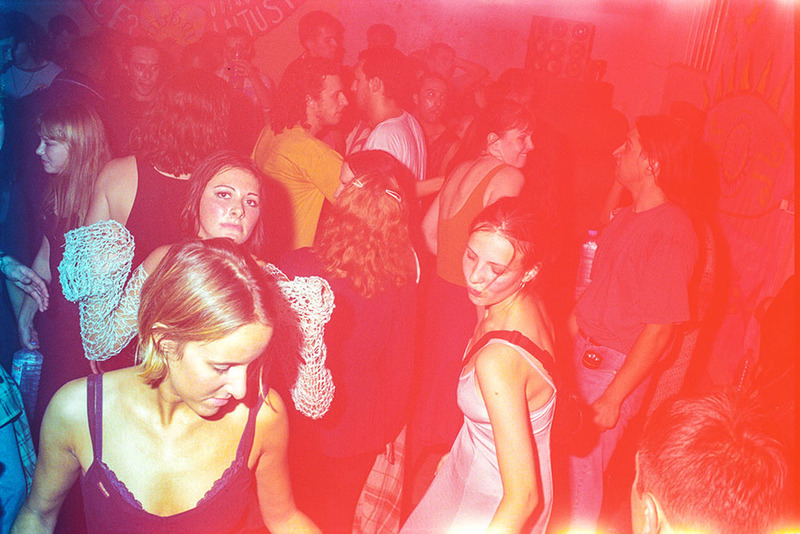 A group of young people dancing in an abandoned Sainsburys in the centre of Brighton squatted to hold a free party with Blue Room after a gig at Sussex University by the Velvet Revolution Tour. A giant puppet in a courtyard at Brighton University, during a gig that was part of the Velvet Revolution Tour. Billy Bragg playing in the basement of The Hacienda in Manchester during the launch night of the Velvet Revolution Tour. A hippie bus called the Dawn Treader with a raving mannequin mounted on top of an upturned boat on its roof parked up at The Rainbow Centre in Kentish Town during rehearsals for the Velvet Revolution. A council provided park up in Sheffield in front of a massive tower block council estate for the tour vehicles involved in the Velvet Revolution Tour. A young man unloading sculptures made by One Eye Sam Haggerty from Circus Irritant from a lorry in Sheffield during the Velvet Revolution Tour. A dog sat in the front of a bus with a CND sign hanging in the front window and a destination sign saying Stonehenge in reference to the great free festival which was part of the Velvet Revolution Tour.